Displays who is on air, in real time. Use it to tell other stations you are one, and see who many be calling or listening. Click here to see who is on. After logging in you get to the main on-air page. The top section of the page is where you enter your information. Operating Frequency: using the designator for a particular channel where possible. Expected on Time: How long you expect to be operating for, this will determine when your entry turns red and eventually get automatically deleted. 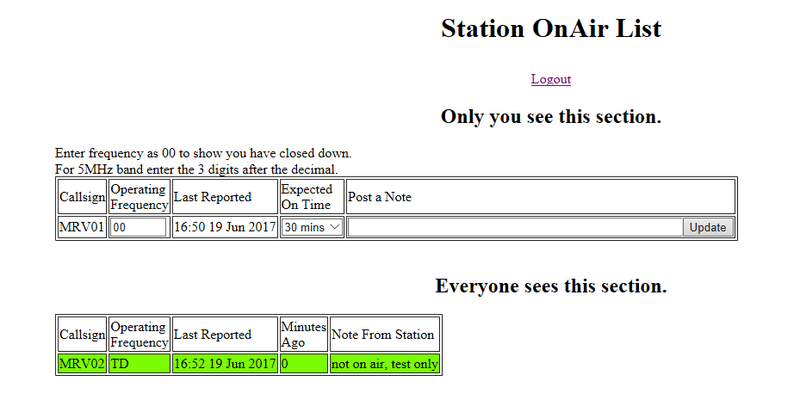 If you go off-air earlier than planned then update your entry with 00 (zero zero) as the frequency. 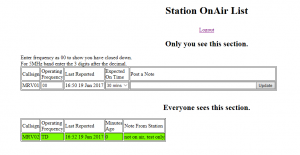 Post a Note: Allows you to display a message to other stations. The screen automatically refreshes every minute. The Air Training Corp potentially has over 1600 of radio stations around the UK.